Belagavi (north) MLA Feroz Sait has lauded the role of St Mother Teresa in rendering humanitarian services to the world stating that ‘the world was blessed ‘ due to her presence by the way of serving the downtrodden and the marginalized. He was speaking at a function at the Immaculate Conception Society at Shahu Nagar here after inaugurating the Mother Teresa Memorial on Sunday. Bishop Peter Machado presided over the function. Mayor Sanjyot Bandekar, Dy Mayor Nagesh Mannolkar were also present. The memorial the first in South India has been erected with special efforts by MLA Sait with grants from Karnataka Chief Minister Siddaramiah. “God sends people into this world with a purpose, Mother Teresa was sent to serve the destitute. Priests, nuns and Christians follow teachings of Christ by emulating them in daily lives,” MLA Sait said lauding the services of Christians towards humanity adding that Christians in this country are known for their silent contribution towards the growth of the nation. In his presidential remarks Bishop Peter said that city of Belagavi which is loved by all and known as the beautiful city will be more beautiful due to the presence of a memorial the name of St Mother Teresa. “ We all love Belagavi, however we will love it more due to the presence of Mother Teresa. 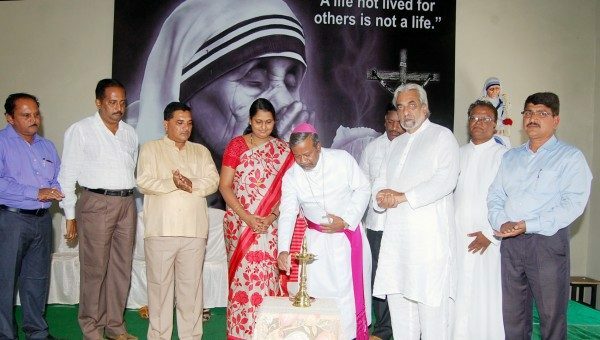 I am extremely happy in soul and heart and grateful to MLA Feroz Sait for the gift of a memorial devoted to St Mother Teresa who was known for the love of human beings irrespective of caste, creed and religion,” Bishop Peter said assuring that the memorial would serve as the epitome of peace and harmony in the city of Belagavi. Long live the memory of the humble service of the late Saint Mother Teresa. This memorial was required in New Gandhi Nagar..